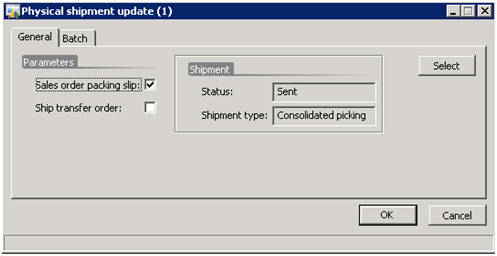 This article describes the setup process of the outbound flow for external shipment in Microsoft Dynamics AX 2009. The process itself has already been described here, so the focus of this article is the settings and adjustments that can be made to the system to enable a typical business scenario within world class warehouses. 1) Use of locations within warehouses. 2) Inventory items are set up to use warehouse management including the consolidated picking method. 3) Output orders are automatically added to a shipment that is not yet activated or a new shipment is automatically created. 4) The shipment reservation runs automatically when the delivery date is [Today – 1 day]. 5) The reservation sequence use multiple warehouses within a site and both batch picking routes and output pallet transports are used. 6) After having been picked, items are delivered to the shipment staging area and the staging can be completed. A shipment cannot be sent until all the shipment lines have been loaded. 7) When the goods have been shipped, the physical update is automatically carried through based on the shipment lines. Why should I continue reading this post? From this post you can get a clear picture of the main steps that need to be accomplished to set up basic outbound flows in Microsoft Dynamics AX 2009. Start by creating a site [Inventory management > Setup > Inventory breakdown > Sites]. 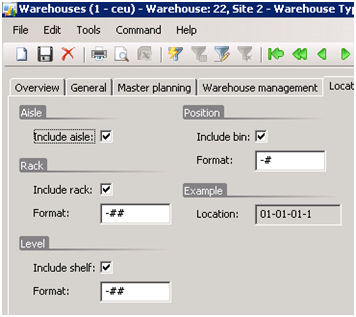 In this example, two warehouses are created and associated with the site [Inventory management > Setup > Inventory breakdown > Warehouses]. 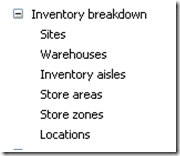 When using warehouse management in Microsoft Dynamics AX 2009 you can set up the warehouse layout. 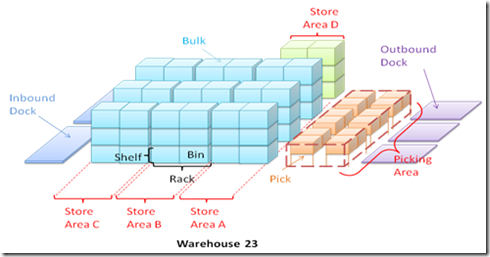 In general, two main strategies can be applied for the warehouse layout. 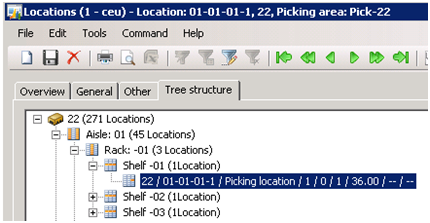 In Warehouse 22 in this example, the picking locations and the bulk locations are on the same rack and in Warehouse 23, the picking locations are in an isolated area. 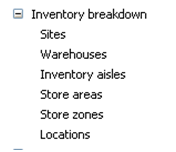 In Microsoft Dynamics AX 2009, a location can be specified by: Warehouse, Aisle, Rack, Shelf and Bin. 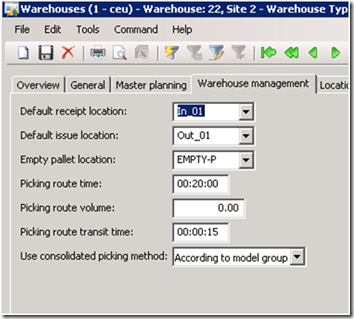 When using the Location wizard [Inventory management > Setup > Inventory breakdown > Warehouses > Functions -> Location Wizard], you must specify the format of the locations for the warehouse at the Location tab. 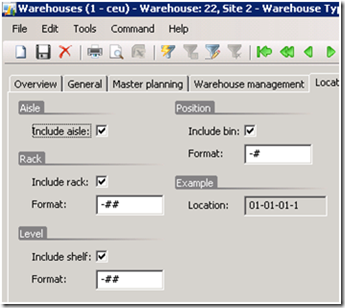 The Location and the Update store areas wizards make it possible to automatically create and update the warehouse layout. You can, however, also create and update the layout manually by using the entry forms in the Inventory breakdown folder. In general, both inbound and outbound layout must be set up. The store zones make it possible to group store areas in order to, for example, ensure that items that need to be stored in a cooling area are guided to a cooling area location. The area on top will be filled first when using random storage and directed put-away with an input pallet transport. 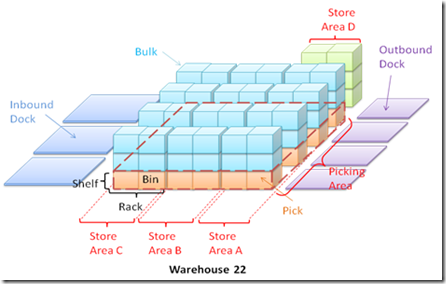 In this example, the bulk locations hold full pallets and both warehouses use random storage. 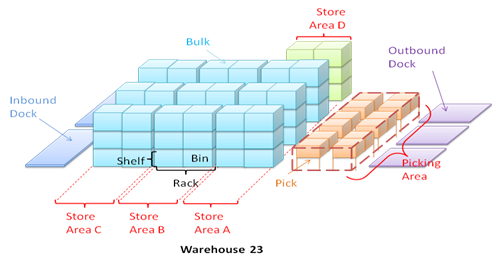 The layout for Warehouse 23 is best suited for inventory that can be controlled with picking locations that have a smaller capacity than the bulk locations. 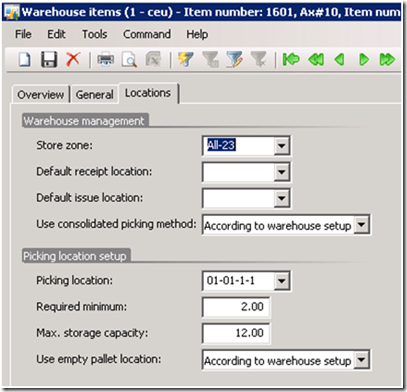 In Microsoft Dynamics AX 2009, the item picking location must be specified on the warehouse item. 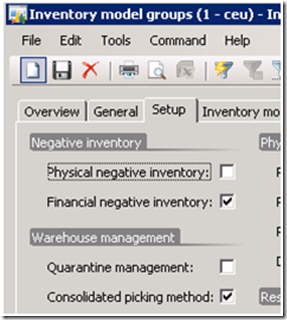 When using warehouse management in Microsoft Dynamics AX 2009, items must be set up to enable the warehouse management processes. 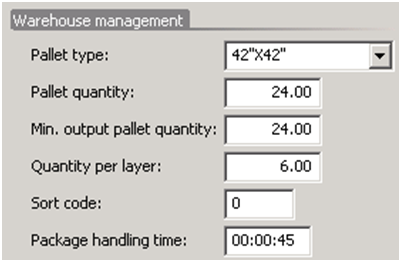 In this example, output pallet transport from bulk locations is used. To control when a pallet transport is created, the Min. 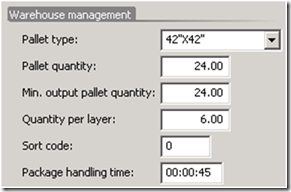 output pallet quantity field on the Setup tab in the Item Details form is set to 24. This means that a pallet transport can be created as long as the pallet quantity is equal to or higher than 24. 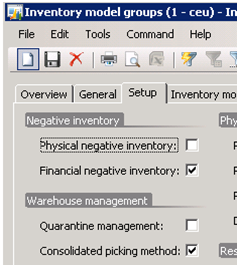 In this example, all items that hold inventory are associated with an inventory model group that uses the consolidated picking method. Items are set up with an inventory dimension group with active inventory dimensions for site, warehouse, location and pallet. Site is specified as a primary stocking location to ensure that the optimal warehouse within the site is reserved through the shipment reservation. 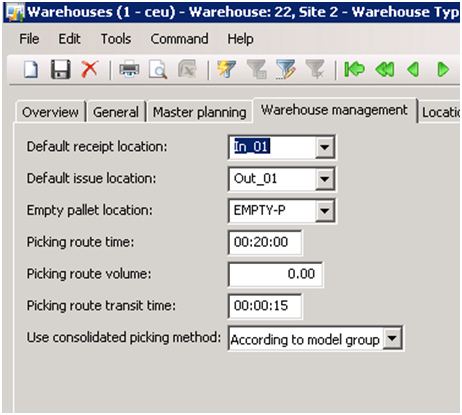 Only items with the Location dimension selected can use an optimized picking route where an operator is guided between the different locations in the warehouse. When a shipment reservation is run, items that do not have the Location dimension selected are added to a new, not-optimized, picking route. 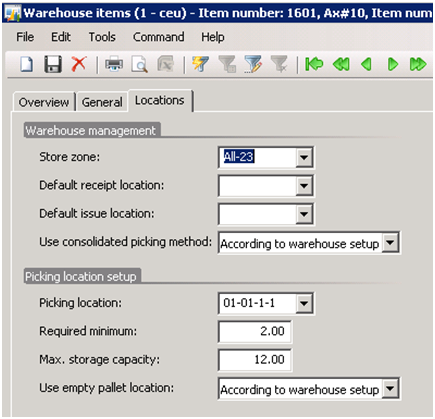 The warehouse item specify different setting for an item related to a warehouse and you enter information about the item picking location and the store zones related to directed put-away in the Warehouse items form [Inventory management > Common Forms > Item Details > Setup > Warehouse items]. 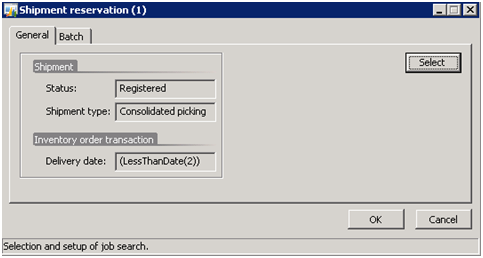 If you specify a value in the Required minimum field, a refill transport is generated from a bulk location based on the quantity in the Max. storage capacity field. Use the Automatic activation check box for individual picking areas to control if the refill transport should be activated automatically. 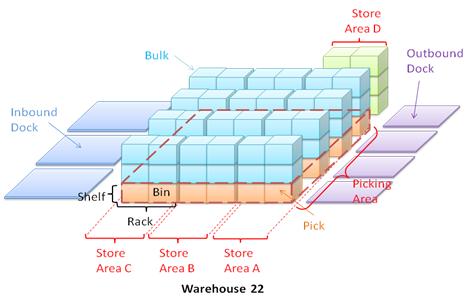 The Mode of handling parameter can be used if both online terminal and paper picking is used within the same warehouse in different picking areas. 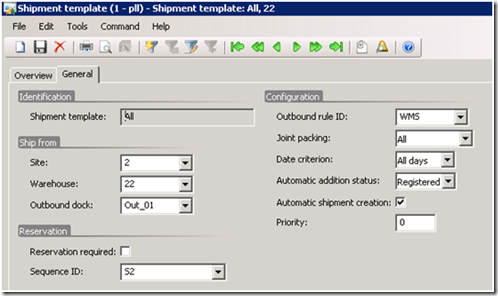 A shipment template [Inventory management > Setup > Distribution > Shipment templates] can be created to automatically assign output orders to a shipment. The shipment type in this example can only contain sales orders related to site 2 and only sales order lines that are going to be shipped with UPS can be part of this shipment. The default shipping location is from Warehouse 22, but inventory from Warehouse 23 can also be used. For both warehouses a full picking logic is used with picking routes and output pallet transports including refill from bulk to picking locations. Clear the Reservation required check box to allow activation of the shipment even though not all inventory is physically on-hand. The priority indicates that based on this shipment template the program starts searching for matching output orders to be added automatically to a shipment. Set up running of shipment reservation in batch under [Inventory management > Periodic > Shipment update > Shipment reservation]. In this case the shipment reservation must be run when a shipment line is going to be delivered tomorrow. To add this query statement, use the LessThanDate(2) method which will return [< “Today+2 days”]. 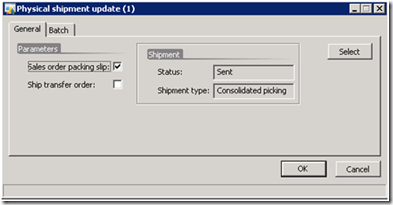 The shipment reservation sequence defines how and where the shipment reservation process reserves. You set up shipment reservation processes under [Inventory management > Setup > Distribution > Shipment reservation sequence]. The shipment reservation process contains different layers: Reservation sequence -> Reservation combinations -> Reservation methods. 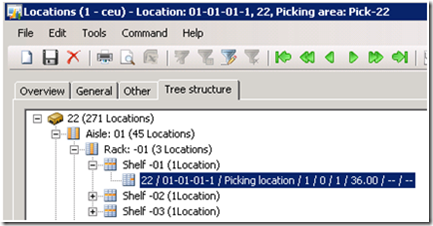 In this example, the reservation sequence at first tries to reserve inventory from Warehouse 23 and if this warehouse does not have enough physical inventory, Warehouse 22 is the next. 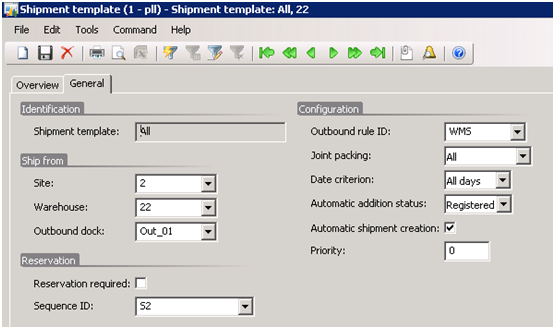 The reservation combination must be enabled for pallet transports and picking route logic. To control the process after picking, an outbound rule must be used and associated with the shipment. In this case, the picked inventory must be delivered to the shipment staging area and it must be loaded before the shipment can be sent. Set up running of shipment reservation in batch under [Inventory management > Periodic > Shipment update > Physical shipment update]. 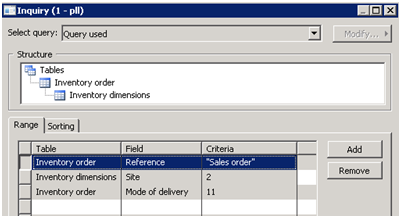 In this example, the related sales order inventory transactions will be deducted when the shipment is sent. Per Lykke Lynnerup & Ievgenii Korovin, Inventory Management, Microsoft Dynamics Ax.